Whether a user clicks “Yes” or “No”, this preference is remembered as a user option. The time the event was recorded. We’ll use this data to look at usage patterns and make the editor experience better over time. Finally, for more details about the technical implementation of this feature, see the GitHub pull requests where it was developed: 2140, 2205, and 2217. If the data belonging to the WordPress community why are they send to WordPress.com? In this case, we should probably think of WordPress.com more as an analytics provider like Google Analytics, not the hosting platform. Many contributors to Gutenberg work for Automattic and thus were able to easily and quickly set up the tracking using the infrastructure they already knew. Setting up something similar on WordPress.org infrastructure would have taken ages. See also #38418. As mentioned in the post, using WordPress.com as an analytics service doesn’t mean the data won’t be public. The data that was collected will be deleted after 0.8 rolls out. Because it’s still so early in Gutenberg’s development, there was not enough collected to provide any sort of picture of usage. 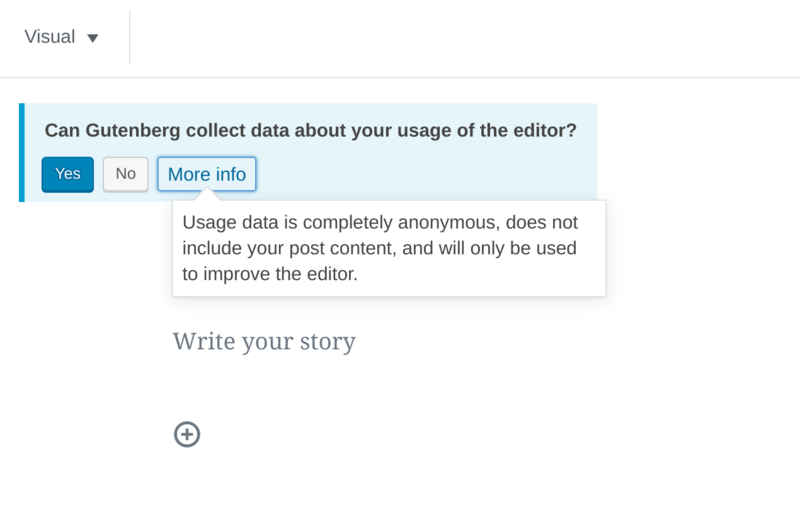 I have to say that I strongly disagree with the decision to yank the telemetry functionality out of the Gutenberg beta plugin. It seems antithetical to remove it when it would literally hand its developers vital data on a silver platter that it needs right now. I’ve been lurking around discussions of fields, blocks, etc. 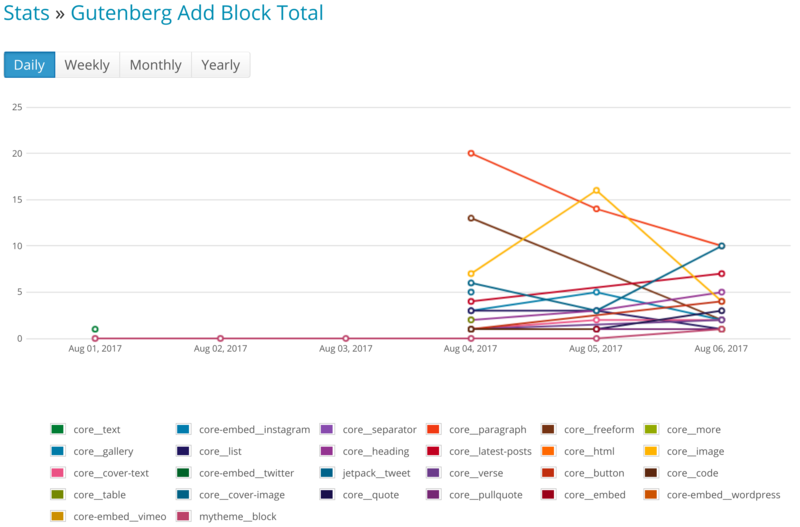 and it seems to me that data collected would show what blocks/embeds were being used, how they were being used, which ones were not, etc. It would then provide a means to look deeper into questions like “Why isn’t anyone using the X block?” Without any data, the team is either restricted to people who run the beta plugin and provide the level of feedback the team needs or they’re just simply flying blind. If you’ve seen my avatar in the WP Slack, it’s pretty obvious that I play Blizzard games. Everything I do in any game I play made by them is logged right down to what I say in chat channels. They USE that data to great advantage in their development and they will openly attribute decisions to certain things. I can go on and on about what’s popped into their games and evolved specifically from data collection. And sometimes those features get refined further. More importantly, and this speaks directly to Morton Rand-Hendrickson’s trac ticket on the issue, putting it and keeping it in Gutenberg provides guidance on a) how useful the data collected is, and b) how to integrate the capability into core for 5.0 or beyond. The issue of informed consent is twice taken care of by the fact that a) one has to enable it to begin with and b) Gutenberg is a beta plugin that one has to actively seek out and install anyways. The same model could be used for core with just notification that the plug-in exists that shows once per install and then an addition to the dashboard that shows status of telemetry (enabled/disabled).